IPCC (2014) median estimates of life cycle carbon intensity of selected electricity sources. The figure includes mining, raw material and waste disposal impacts, but excludes infrastructure requirements such as energy storage, strengthened transmission grid, or backup generators. As a result, the figures are likely to underestimate emissions from variable sources such as wind and solar power. To avert dangerous climate change, we will need lots and lots of low-carbon energy sources. Electricity is perhaps the most important of these, as it is wonderfully flexible form of energy that can replace fossil fuels in multiple applications. Furthermore, it is easy to deliver and we know how to generate it in quantity with very low carbon emissions. Of all the methods of low-carbon electricity generation, nuclear power is still the single most important. It alone produces far more low-carbon electricity than all the “new” renewables combined. This is an inconvenient fact for those who try to oppose nuclear power while simultaneously opposing climate change. As a result, one hears constantly claims that nuclear power produces greenhouse gases – and that this makes it unsuitable for climate mitigation. The first part of this claim is true: In fact, no energy source produces energy without greenhouse gas emissions of any kind. There are emissions associated with wind power, and there are emissions associated with solar power. The second part, the inference, is false, however. In all the serious research on the subject, the carbon balance of nuclear electricity is found to be very low. It compares well with wind power and, in fact, tends to be lower than that of solar electricity. Fortunately, we can say that this counterargument does not hold water. The figures quoted here, and in any serious scientific report, are so-called lifecycle emissions. This means that the figures already include impacts from mining, building of power plants, and so forth. In our opinion, it is somewhat insulting even to think that such obvious emission sources would not be included in any serious calculations. But one thing that’s not included in these calculations is the additional infrastructure that is required to deliver equivalent level of service. For nuclear power plants, not much additional infrastructure is required, beyond obvious power lines. But if we want to deliver equivalent service – equivalent amount of reliable electricity generation – from variable sources, we most probably are going to need more infrastructure. This can be reinforced electricity grid to transfer energy from places where the wind blows or the sun shines to places where electricity is needed; it can be backup generators that provide power when it’s dark or calm; or it can be wind turbines and solar panels that are part of “overbuild” required to ensure that at least some catch the wind or the sun at all times. So far, as the share of variable energy sources in electricity grid has remained small, this additional infrastructure is not really needed. The existing grid and existing power plants can cope with the limited variability, although this often incurs extra costs already. But as we expand our low-carbon energy production, we will need more and more infrastructure to cope with increasing variability. This causes both economic and environmental costs, resulting to higher carbon balance than these simple calculations would suggest. This is one of the reasons why we believe that opposing proven solutions that can provide significant quantities of low-carbon energy is, at this point, a gamble with the climate. 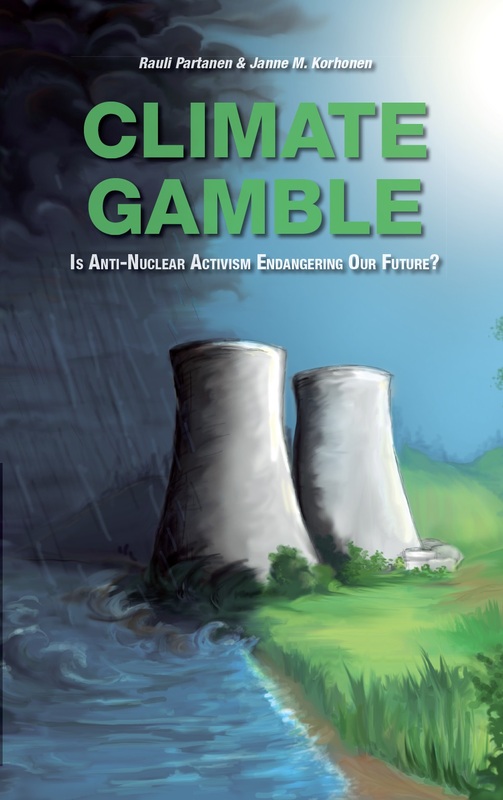 For more information, buy our book, Climate Gamble – or come to Paris during the COP21 climate negotiations and get one for free! Land use of equivalent wind and nuclear power generation (ca. 27 terawatt hours per year). 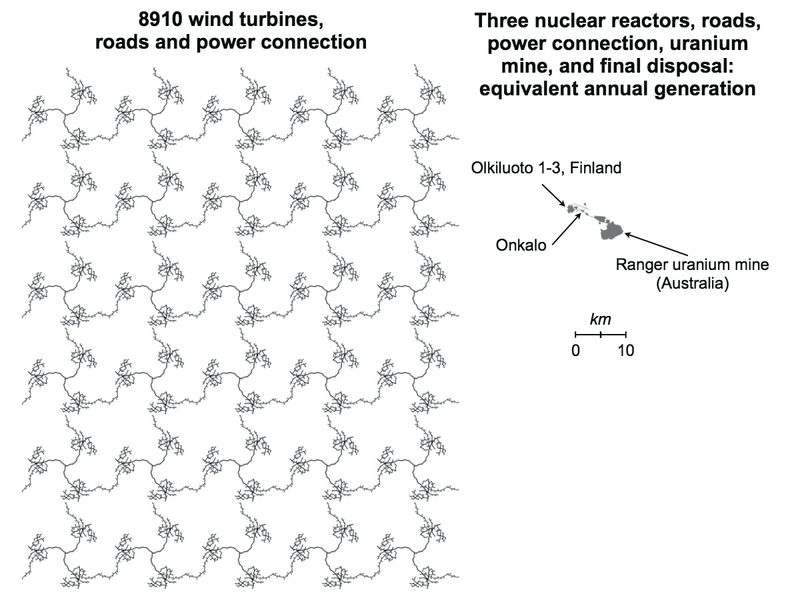 Examples are Olkiluoto nuclear power plant and Onkalo waste repository (Finland) with Ranger uranium mine (Australia), and a composite graphic based on Oosinselkä wind farm (3 MW turbines). Maps are to scale and include only essential roads and power connections. Besides climate change, one of the major environmental problems of our age is biodiversity loss. As it is caused largely by increased human land use, stopping biodiversity loss requires us to reduce the land footprint of humanity. A major problem with renewable-heavy or renewable-only energy scenarios is that they essentially do not acknowledge any problem with human land use. In these visions, vast areas are to be dotted with wind turbines, filled with solar panels or (perhaps most problematically) used for biofuel production to produce enough energy and to deal with intermittency of stochastic energy sources: if you’ve ever heard the explanation “it’s always windy somewhere,” you’ve heard a call to build two to five times as many wind turbines as their nominal production would suggest. Compared to wind, solar and biomass farms of the required scale, the environmental footprint of nuclear energy is very small. The graph above attempts to show this difference, based on real-world projects in Finland (and an Australian uranium mine). Note that this is for similar annual production of about 27 terawatt hours: to produce energy of similar quality – that is, non-intermittent – one would probably require at least three wind farms of equal size, spaced far enough apart, or significant energy storage facilities. Note also that the figure likely overestimates nuclear land use. The Olkiluoto plant contains a reserved area for fourth reactor, capable of increasing the annual production from same land area by as much as 13 TWh; and the Ranger uranium mine could easily supply many more reactors. We would like to emphasize that this picture should not be construed as an argument against wind power or other renewables. We almost certainly need all the low-carbon energy we can have, and both wind and solar have, on the whole, much lower environmental footprint than fossil fuels. The only reason we publish this image is to show that the oft-stated claim of nuclear energy’s environmental destructiveness is misleading at best, and outright falsehood at worst. Renewable energy installations (nameplate capacity) have recently even declined, long before the build rates required for decarbonization have been achieved. Particularly worrying is the sharp decline in solar PV installations in Europe. Sources: EPIA & GWEC. The previous weekly pic introduced the calculations of Loftus et al. (2015), which show that decarbonization scenarios that do not allow nuclear energy require stunning, unprecedented rates of new clean energy installations. Even though the popular press is today awash with news of renewable energy achievements, these required rates are still far away. More ominously, there are some indications that the rate of increase in renewable energy installations may be slowing down, perhaps even stalling. The most prominent example comes from solar PV installations in Europe. 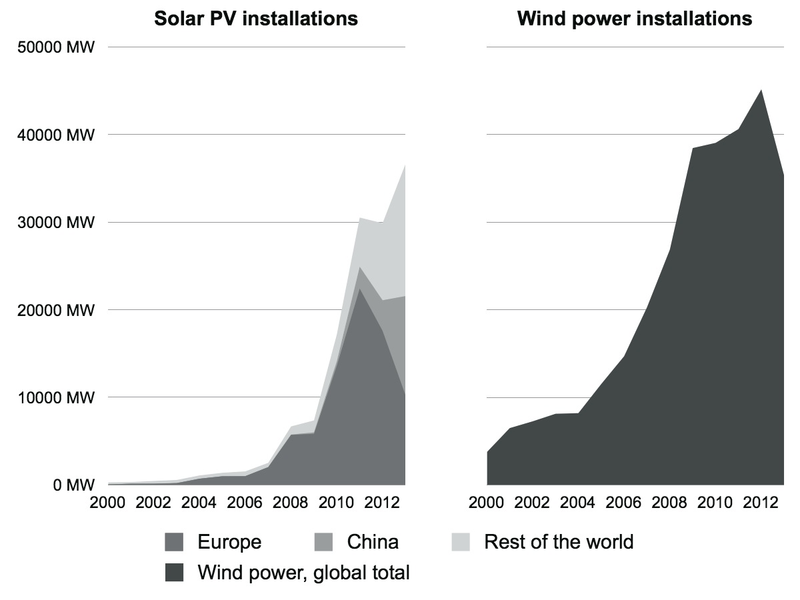 Compared to peak in 2011, new solar PV generation capacity is being installed far slower. Subsidies have dried up, and although installations still continue, the major problem is that the rate is far from what’s required for decarbonizing the economy. Furthermore, as solar panels (and other energy generators) inevitably age and need to be replaced, the rate of new capacity addition soon needs to increase even further, simply to replace retiring generation. It is more than likely that the installation rates will increase from the lows presented here. Nevertheless, one needs to remember the previous post’s message: if we want to decarbonize without nuclear power, we need absolutely huge increases from current installation rates. It bodes ill for the prospects of these rates being achieved that these hiccups occur already, when solar and wind together still provide less energy to the world than nuclear power alone. Nevertheless, some members of our society still think the required increases in renewable installations and energy savings rates are done deal, and that we can forget about nuclear power entirely. These graphs point out again that this stance is a huge gamble with the climate. 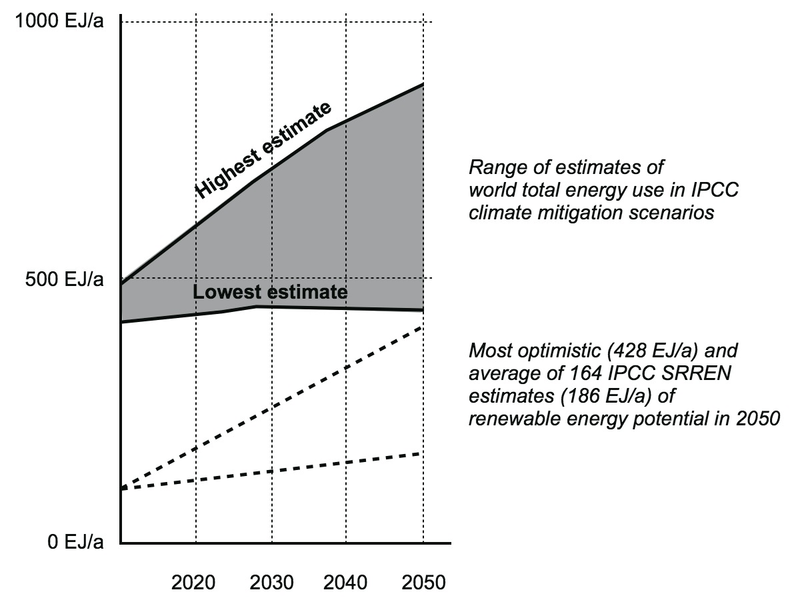 In the previous two posts, we showed with IPCC data how the climate mitigation scenarios proffered by anti-nuclear groups are based on extreme optimism on not just one but two counts: they assume that renewables will grow at least as fast as, and that energy demand increase can be checked at least as well, as the most optimistic IPCC projections allow. Generally speaking, if the plan depends on not just one but two factors developing according to the most optimistic assumptions, one might want to have a different plan – especially if at the stake is the future of our only habitable planet. But how much are these plans assuming, in fact? This important question is partially answered in a recent study by Loftus et al. (2015), which examined 17 widely publicized global decarbonization scenarios. These included three scenarios (from World Watch, Greenpeace, and Stanford professor Mark Jacobson et al.) that explicitly attempted to stabilize the climate without nuclear energy – relying solely on energy efficiency, renewables, and fossil fuels. The key results are summarized to the graphic above, and compared to short term, historically achieved records (that is, the best single year ever). For renewable only scenarios, energy efficiency needs to improve every year almost twice as fast as has been achieved in the best year in record. 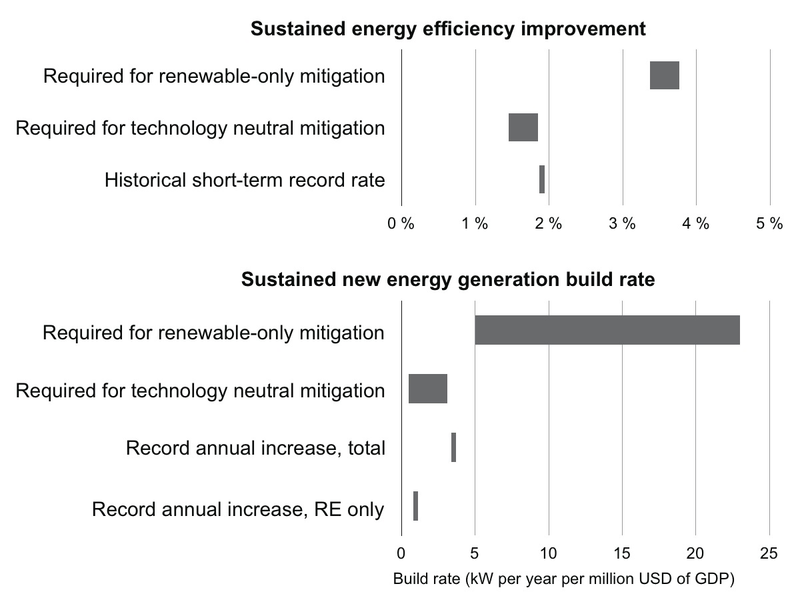 Simultaneously, new (renewable) energy generation must be built 1.4 to 15 times (!) faster than new energy generation from all sources together has been ever added in a single year – and this build rate must be sustained for decades. Succeeding in either one of these alone would be a monumental undertaking. Succeeding at the both at the same time may be technically possible, but it is most certainly a gamble – a Climate Gamble. It is highly unlikely the world can be powered by renewable energy sources alone by 2050. This is one of the conclusions of the IPCC’s often cited but rarely read Special Report on Renewable Energy Sources and Climate Change Mitigation, or SRREN. Published in 2011, it reviewed 164 energy scenarios that focus on the role of renewable energy in the world energy supply. While the report finds that the maximum “technical potential” of renewable energy sources is indeed large, these scenarios – which attempted to take into account at least some economic and other practical limitations as well – found that their realizable potential is probably much less. The above graph sums up the results. Not one of those 164 scenarios could deliver, in 2050, even the amount of energy used in the world in 2010. 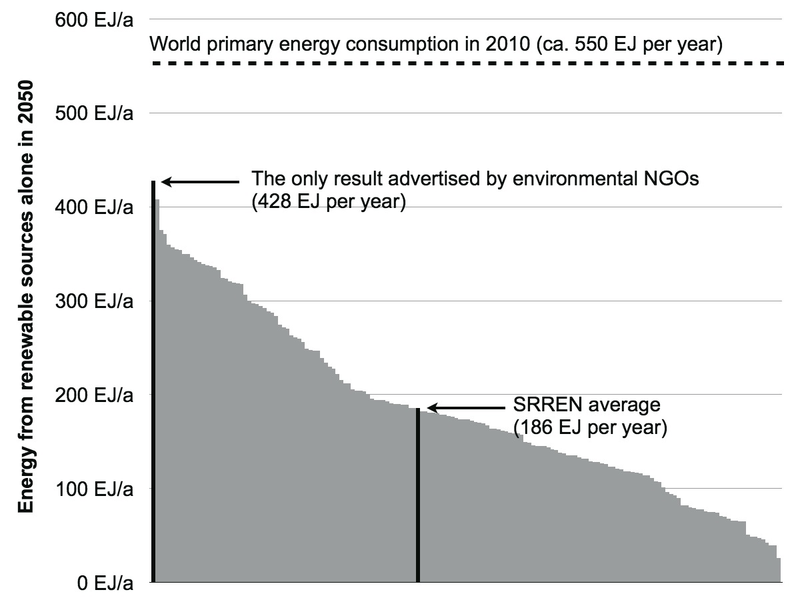 Even the most positive outlier, based on Greenpeace’s Energy [R]evolution study (which in turn was largely based on data from renewable industry lobbyists) delivered only 428 exajoules per year. The average of all scenarios was much less, only 186 exajoules per year. The SRREN report was by no means overly critical of renewables. As several commentators noted after the report’s release, it downplayed or even omitted discussion about several problems with high renewables scenarios. For example, the feasibility of different scenarios was not really assessed: they may be technically possible, but can the world politics put them to practice? And even if the most optimistic of those 164 scenarios is put into practice and runs into no unforeseen difficulties, the world energy demand needs to drop drastically while world population grows to 9 or 10 billion. Let’s suppose we’re building a bridge and order 164 engineering analyses of the proposed structure’s soundness. Every single one of these analyses suggests that the bridge will be unlikely to withstand current traffic, much less the likely increase in the future. We proceed with the plans anyway, and even declare that our plan is the only one worth mentioning. Are these the words of a responsible designer? Are the words of Greenpeace – and others who advocate for zero nuclear energy – responsible, or are they a gamble with the climate?